I often hear things like "It's none your business what I do!" Whenever someone behaves irresponsibly in a public medium, it's my business to speak my mind about it. If you don't like criticism, then either stop doing irresponsible things, or stfu. You have no business telling me what is or is not my business. Very well put sir! I recently had an incident and I sat down the next day and did a long detailed recount of the incident followed by what I have learnt and will be taking away for future chases. Enjoyed this blog post! Very well written my friend. Very well written. James Menzies NEWS 9 Storm Tracker. What I do not get is what is all the hype over two chasers getting to close. I have a stake in this because one is my son. Not once have I ever told him to not get to close. He is a very knowledgeable when it comes to weather. He is also a grown man, I would trust him with my life and in fact have been with him. When I told him that I finally wanted to go see a tornado after he was into this hobby for 5 years or so, I said let's go. He drove us right to one which happened to be I guess an F4 in Shawnee, Oklahoma. He does know what he is doing. He would by NO means put his life or others in danger on purpose. He was close and was videoing and so what? The amateurs can see for themselves through the video, what needs to be said. Who's to say that this training video is over? What is sad is that, without volunteers to get footage of anything dangerous, we wouldn't have any videos. Imagine people jumping in the water with great white sharks, jumping off cliffs,race car driving chasing tornadoes or any other dangerous sport or hobby. We do what we do, we live by our own virtues, not ones of others. I think you should be praising chasers who warn the public and do search and rescue as well. Instead guys like yourselves beat down the good that comes from information given by men like them. Without men like the two your talking about life in the fast lane would be slow or come to a stop. Then what would you write about? 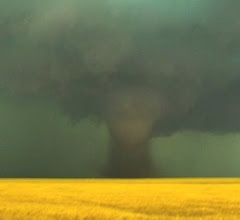 What is different about Storm Chasing compared with other dangerous sports or hobbies. With out video of the particular sports or hobbies one I would think find life a bit boring. We see video's of people in the water with great whites, cliff diving, race car driving at 275 mph, rock climbing, tight roping across the Grand Canyon and Storm Chasing. People can think it is nuts other people find it fascinating. It is the choice of the individuals to be who they are. If you disagree with the actions of these men you must also disagree with the actions of other seekers looking for the unknown and also the thrill. What is it about the weather that make it so different from the other attractions. What say you? I appreciate that you have confidence in your son's judgment. Unfortunately, I don't share your confidence. The video shows clearly that they were in that position to be in danger from a tornadic storm as a result of their chase decisions. You likely don't have the context to understand my concerns regarding the showing (and sale) of such video, but I will try anyway. When chasers put out such video, they encourage others to emulate them. Even experienced chasers make mistakes and errors in judgment, but it seems unethical to me to seek to capitalize on your mistakes and add fuel to the criticism that storm chasers are basically lunatics. I get concerned because their public airing of bad judgment encourages the faulty stereotype of stupid chasers putting themselves deliberately in harm's path. Your logic is flawed in your second comment: "If you disagree with the actions of these men you must also disagree with the actions of other seekers looking for the unknown and also the thrill." No, that conclusion does NOT follow from the premise of disagreeing with the actions of these chasers. Not all participants in dangerous hobbies behave irresponsibly. The road to hell can be paved with good intentions, after all. I have written extensively about this in web essays and blog posts. Perhaps you should consider reading some or most of that in order to gain a more extensive understanding of what constitutes responsible storm chasing. The degree to which chasers constribute to saving lives is greatly exaggerated ... typically by the chasers seeking to rationalize their actions. Chasers are not out there chasing to save lives ... chasing is a basically selfish activity. If they want to save lives, they should become spotters for their communities, or get trained and become first responders. 2. The encouragement of equally irresponsible emulators. "Without video of the particular sports or hobbies one I would think find life a bit boring." It is quite humorous to think that the magnificent human mind could possibly be in a permanent less-than-satisfied-state if not for videos of extreme sports and stunts. To even think we could be "bored" without the existence of extreme video seems to be a classic trap/lie of mass media. Any adult, of sound mind, should be embarrassed to ever utter the words “I am bored”. Like anyone else, I have been to many events and meetings in which the content of those events could be described as "boring", yet the activity of my own mind during such events has always prevented me from being "bored". If people can fully embrace that last sentence, I think they will find one of the keys to real happiness. I'm not entirely a great fan of such extreme videos being posted at all...unless it's done by someone such as Reed Timmer. That said, I DO get really tired of reading "INSANE" and "EXTREME" and "INCREDIBLE" being at the beginning of most of his tornado video titles. A lot of this "extreme chasing" can probably be attributed to his influence anyway. But I digress. My point here is in memory of the infamous Kansas Turnpike video, with the tornado that succeeded the Andover F-5 amidst the same parent storm. I recall you as once saying that they just need to stop airing that video, with all its influence on taking shelter as overpasses. You can use such "extreme video" to teach people that it's not a good idea, but in the end...monkey see, monkey do. Though I intend to write novels about the lives of college-age storm chasers and their friends (and actually teach SOMETHING legitimate about the weather and chasing), I have concern about an upcoming movie called "Into the Storm" which I feel may encourage this kind of "extreme chasing" behavior.